I've talked about Mavericks before. 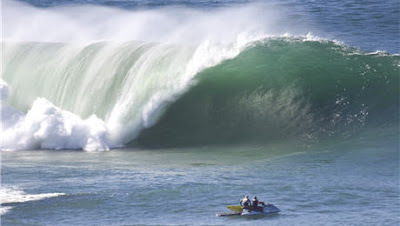 The contest starts Saturday with waves expected to be 25-30 feet high. If you have any interest at all, you can watch it on myspace. Remember it's freezing water, jagged rocks, sharks, and 50 foot + waves. sharks scare the crap out of me. even on a nature show on tv where they are being harmless and minding their own business. i get anxiety just looking at them. You know what, while there are sharks out there, they are far and few between. At www.montereybayaquarium.org they have a live web cam in their deep ocean tank and right now there is a small great white in there. We saw it live and when it swam right towards us I actually got the fight or flee( more like run, run away!) feeling and there was a 13 inch thick pane of acrylic between us. I've never experienced that before and I'm not sure I'd ever want to. Come on.....where is your sense of adventure? Talk about cool mom points..."Hey kids, look at Mommies stitches from where the big fishy bit her." Nah, the only thing that would give me cool mom points would be if I pulled out the sharks tooth out of my side before I went to the hospital! These kids are a tough bunch.